Aiden and the Grocery Stop – Publix Super Markets, Inc.
A quick grocery stop, anyone? 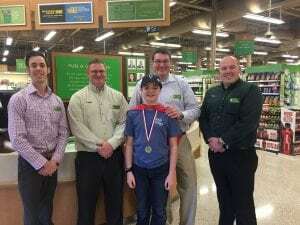 As much as Aiden would have probably loved to help his parents out with their grocery list, the purpose of his stop by Publix was to visit yet another one of our outstanding CMNH partners! Publix has been a partner since 1992 and has risen over $44 million in the states it supports, an impressive feat considering that in 2018, Publix only has established markets and footprints in seven states in the southeastern part of the United States! Here at Children’s Hospital at Erlanger, we are so thankful to partner with a business that is so heavily invested in serving its surrounding communities. Our local Publix locations raised over $25,000 in 2017! So of course, Aiden had to stop by and show his appreciation like the great Champion he is! Make sure to mark your calendars for May 31-June 6 to stop by your local Publix to purchase a miracle coupon for $1, $3, or $5. Not only will you receive coupons to use on your next trip, you will be supporting your local children’s hospital through Children’s Miracle Network Hospitals. Happy shopping!